As US bomber operations began to take place at airfields all over Southern England from the summer of 1942, the vehicles used in servicing their Liberators and Flying Fortresses were slowly changing from the standard RAF support vehicles, to specialised US Air Force equipment. From fuel trailers to bomb trolleys, Bedfords were quickly being replaced by Chevrolets. 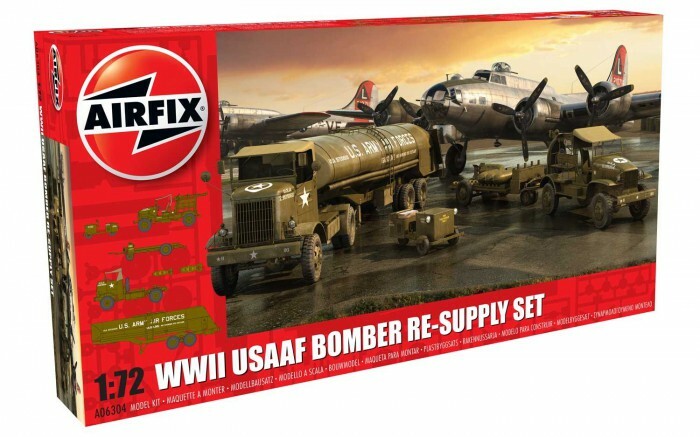 Package contains: Cushman Model 39 Package Car, Chevrolet M6 Bomb Service Truck, M5 Bomb Trailer, Autocar U-7144-T 4x4 Tractor Unit and F-1 Fuel Trailer.